Very easy to cook and delicious! Enjoy it. Directions: Boil and shred the chicken. Cut vegetables into small sticks. Blend the ginger, onion, cilantro, white wine and sesame oil. Add the sauce to the shredded chicken and mix well to coat. 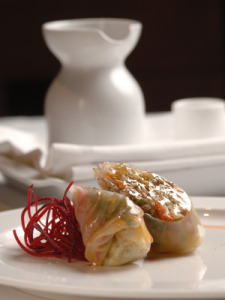 Fill each rice wrapper with a mixture of the vegetables and the chicken, fold in the edges and roll to form each piece. Slice in half and garnish with basil.